Finally my snowdrops are starting to come out. Love them in these tiny glasses - I'll have to look out for more of these venerable curvy sherry sippers as they are perfect for posies. 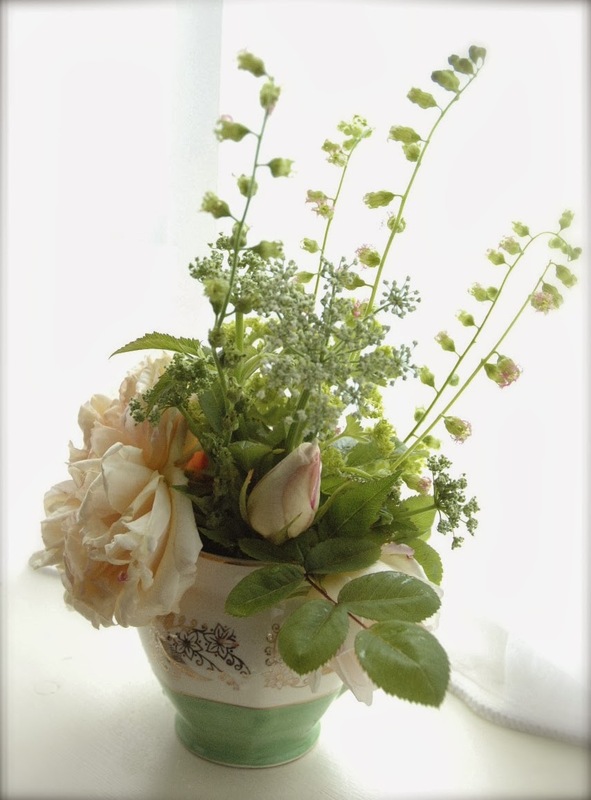 Plan to do lots of these on my stall with other small flowers. Makes me feel all spring-y. As these snowdrops are in the border I've widened, I'll also keep an eye on when they finish flowering, because that's the time I'll need to hoick them forwards to the front of the border as they are traditionally moved 'in the green' rather than when they are dormant. Watch over your snowdrops and seize this moment to split them into new clumps to start off small new colonies in shady corners which cry out for some late winter/early spring highlights. 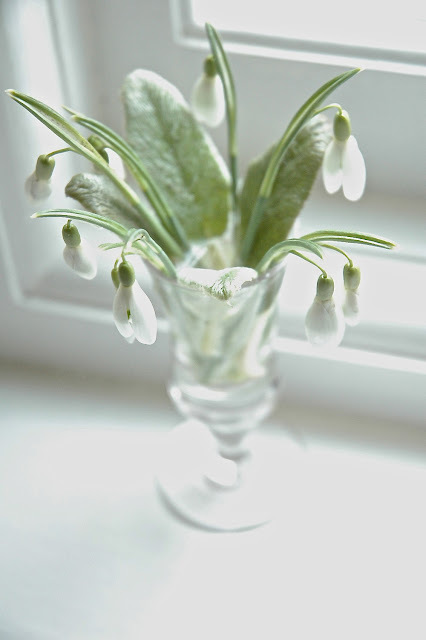 Wow you have already some snowdrops inside. Every day I walk around my garden and look at them, they are just showing white buds I have to wait another few days. After flowering I always split the clumps too. I've been jealously eyeing ones down the road for the last fortnight as they've been flowering their heads off - mine are just starting to catch up now. Beautiful! I planted most of mine lasst year so I haven't got that much flowers yet, hopefully I will get lots of flowers next year so I can take som in too. Your positive response is encouraging - hope people will part with money for similar later in the year! 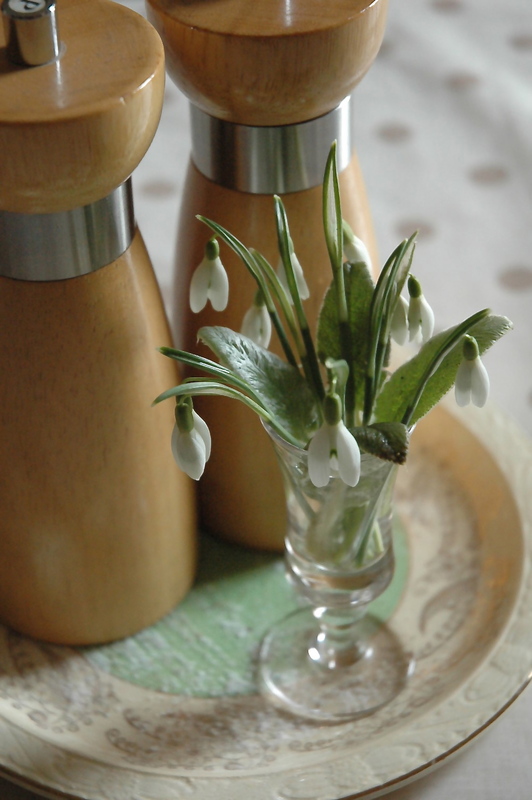 I am anxiously awaiting my own snowdrops. I do have one small clump that bloomed early then got blasted by subsequent ice and snow. So did mine, but they're tough little herberts and will probably come through it all with flying colours. Thanks for the feedback - makes me feel better! Beautiful photos of snowdrops! I love them in that vase. I have had a few outside for a month, but no more yet. We have more snow this week! ugh. Looking forward to spring!! Thanks. I'm getting addicted to trawling the charity shops for tiny sherry glasses to put little posies in - my china shelf is full to bursting with my hauls. My snowdrops are really coming along now and my first iris siberica came out this week too. It's trying to snow here again though, so wish it would hurry and warm up so I can get gardening properly. Am starting to lose patience now! They look lovely. Mine have been out for a while but I don't really have enough established to justify cutting them. I've just come back in from cutting another couple of sherry glasses-worth and thinking that I need to multiply my stocks even more - have earmarked the area under the large trees at the bottom of the garden as a possible spot to do this in a few weeks. I'm just greedy!